ALBUM 4 TRACKING IS DONE! Album 4 in the can/drive/bag/done. Couldn’t have had a better experience with the guys and Greg who made our experience all that much better, professional and fun. The Grove Studios provided a perfect environment and ambience to make us comfortable and creative. Super professional and well run studio. Thanks to Jack, Matt and Owen for their work. Really proud of all of us and the record produced. Long days, hard work, etc. 18 months of writing and slogging it out has come to a great finish. It’s huge, epic, sad, lamenting, poignant and beautiful. Great times. More to come. Hey everyone, meet Carl. You may recognise him from previous WLTS tours or his band Lo! He’s been our mate for forever and has been filling in for us on 3rd guitar since 2017. We’ve finally convinced him to join the band as a full time member. He’s a great guitarist (even though he plays upside down guitar) and a great dude and we’re stoked to have him on board for the new album and beyond. Here he is looking heaps serious when he’s really not. Good times ahead! Hey everyone, meet Greg. He shares the same name as a famous Australian golfer. He’s in control of our session. We flew him all the way from Chicago to listen to our nonsense and make us sound heaps better than we do. He’s a voice of reason and a world class engineer and we’re happy to have him on board. He’s worked with a million bands but the one’s we admire the most out of the extensive list are Russian Circles, Godspeed You! Black Emperor and Neurosis. We are in good hands. Something we’ve been sitting on for a while busting to share... We were lucky enough to be asked to have a bit of A Gallant Gentleman in Ricky Gervais’ new show, After Life that just dropped on Netflix. It’s a really poignant scene and we’re stoked to be apart of it. No spoilers, you’ll have to watch to find it. Great start to the recording week! Here’s a bit of a teaser for the live record. This will be out in early March. Pre-order available now! This is a live recording of our first ever overseas show at Dunk!Fest in Zottegem, Belgium in June 2017 where we played Departure Songs in full. A show we almost missed after blowing out two tyres on our gear trailer somewhere on the side of a German motorway. This is an energetic and visceral rendition of Departure Songs by a band who were excited to be in Europe on a big stage. This 180gm double vinyl is being released through WLTS and Bird’s Robe Records (AUS/Asia) Dunk!Records (EU) and Translation Loss Records (US). Each label will have their own exclusive colour variant. Artwork by Error Design. Track list is the same as the studio record of Departure Songs. We are pleased to announce the release of pre-orders for the live at Dunk! 2017 double LP. This is a live recording of the our first ever overseas show at Dunk!Fest in Zottegem, Belgium in June 2017. A show we almost missed after blowing out two tyres on our gear trailer somewhere on the side of a German motorway. This 180gm double vinyl is being released through WLTS and Bird’s Robe Records (AUS/Asia) Dunk!Records (EU) and Translation Loss Records (US). Each label will have their own exclusive colour variant. Sorry we’ve been quiet, it’s been a busy time working on the new album this year. I just noticed we haven’t posted on here since May! To be honest, nothing really exciting has happened since then. We also get caught up in social media and then I forget to update our site. Since we got back from China in March we’ve really just been in a small grey rehearsal room slogging away at riffs and songs. Sometimes it comes easy, most of the time it’s a lot of hard work and frowning. We did one thing during that time that was really cool. We went to the south coast of NSW to a lovely house on a hill to do a weekend writing session (pic below) that was a really awesome experience. Would do again. What I can tell you is that we have a studio booked in March to go in a record our new album. It doesn’t have a name yet and some of the songs still aren’t 100% finished, but we’ll get there. It’s all down to the pointy end right now! We’ve had a lot of people asking about the new album and if it will be the same as Departure Songs. I still don’t really know what you guys mean by that. Are we releasing a sequel to DS? No. Are we writing the same type of music? I think so - big? yep, long? kinda, cinematic? we try our best. Does it have a theme? Yes. Oh cool! Can you tell me?? No. Anyway, you guys can answer all those questions yourself when it gets released. That’s all I’m saying for now. We also have a couple other announcements coming up so stay tuned and I’ll try and update this page more often. Maybe. I decided to screen cap my work on the latest We Lost The Sea poster for our tour to China in March. This is the first time I've done this and it's already helped me with picking out things I like and things I need to improve on. I'm always learning and trying new things. This is about 6 hours of video squashed into 3.5mins. I forgot to turn on Quicktime sometimes and I think I missed some bits along the way, but you get the gist. I use Wacom and Photoshop with some sketching done with pencil and paper. Here's the folio page on Behance. He was kind enough to let me use this song even though the album isn't released yet. 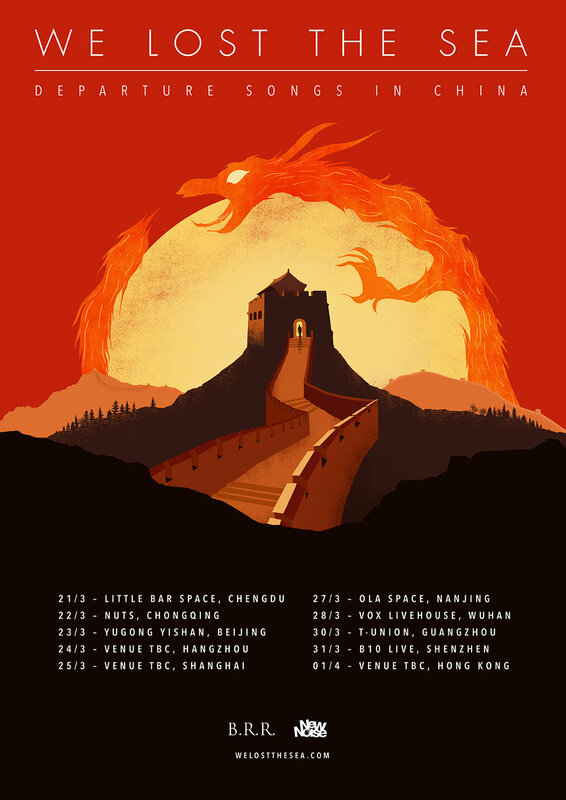 We’re extremely excited to announce that we will be heading to China for a 10 date tour starting in March. This will be the first time the band has been to that part of the world and we’re all looking forward to an amazing experience. 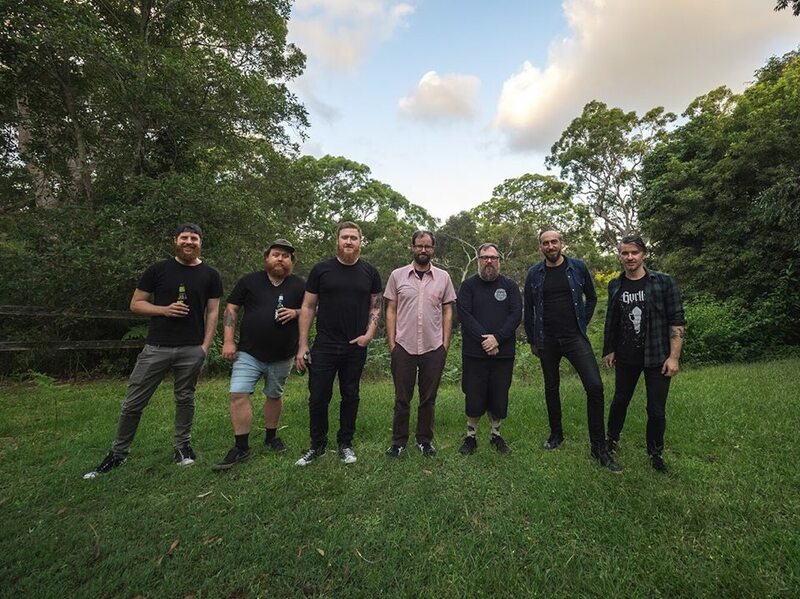 We’ll be following in the footsteps of other post-rock legends such as Mogwai, Mono, Caspian and sleepmakeswaves to cover over 5000kms across the country with our last stop in Hong Kong thanks to New Noise Touring. We’ll be taking Departure Songs to places we never thought a possibility when we released it. Anyway. We have all this other cool stuff! -Ye olde longsleeves, just in time for summer! Some of these will be available online after tour. Last shows for ages and probably the last time we'll play most of these TQPOE songs. Come and hang out, it's been a big year, let's celebrate. See you in a bit! We've managed to sell out the Lansdowne show and have decided to do something new for us and open up a second show the same weekend! This time we'll be joined by our mates in Arteries and more special guests to be announced. Tickets are on sale now! We have some new TQPOE astronaut enamel pins for sale! Head over to our Bandcamp page to check them out. TQPOE CD Fifth Anniversary Reissue. 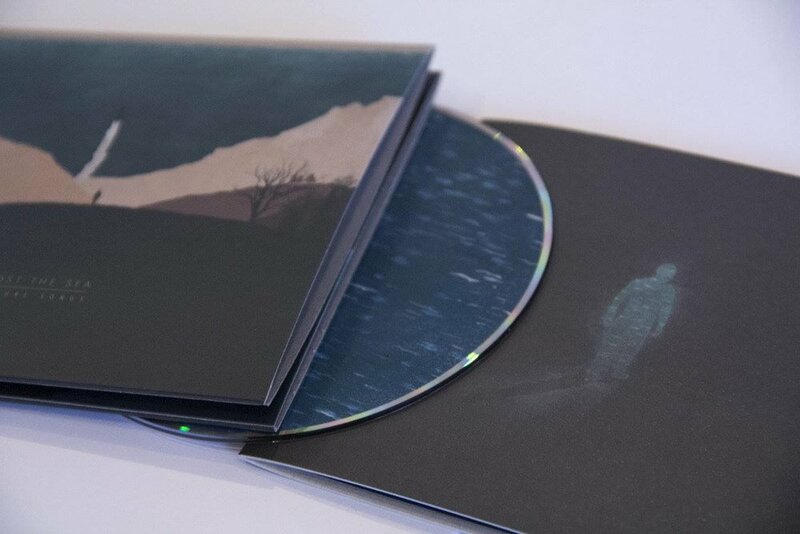 The fifth anniversary version reissue of The Quietest Place on Earth CDs in time for the tour. 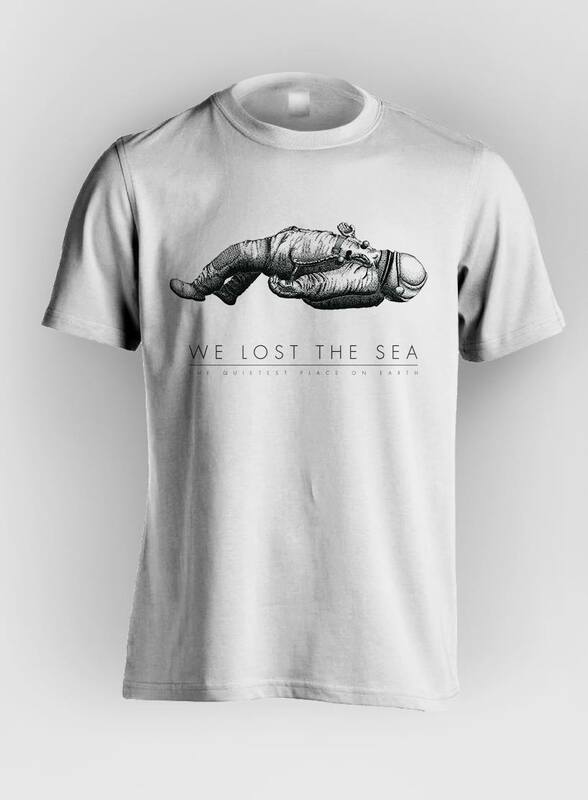 More new merch to come! We’re pleased to announce the supports for the Five Years of The Quietest Place On Earth tour in December! We're stoked to have our Europe buddies Meniscus with us for a couple of these shows. They'll be joined by electro shoegazers Requin in Brisbane and whimsical pop local heroes half/cu in Melbourne. In Sydney we’re joined by SEIMS who have just released their new record that is a frenetic mix of drumming, grooves and noodling. Opening for us will be one of our favourite Australian acts, Wartime Sweethearts. half/cut come with us to Adelaide joined by local post-rockers, iia. 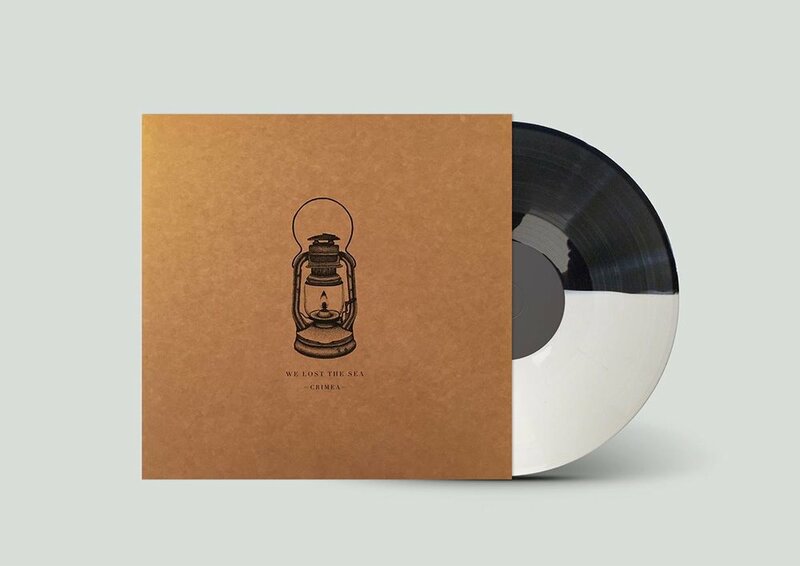 We will have vinyl, exclusive tour prints and merch with us. Have we got a deal for YOU. We’re finishing up the year with these shows and going into writing mode until later next year. Come see the year out with us. More new merch comeing soon.